Nice dig Letitbe793. 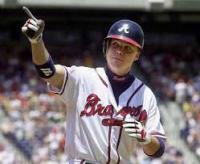 I'm a little bit of a Braves fan and i have to admit I didnt have him on the main radar. He needs to lift his leg higher to allow his arm to come on top more which will add more downward plane. He doesn't bend over very well. Notice how when he misses he misses up with the FB. Arm is behind when the foot lands just a tick. This problem i bet gets more noticeable the more tired he gets. 30 team Dynasty Fantrax, 2nd year need new owners. STL Catcher, 23 yrs old 6'1 200 lbs. R/R. If you read nothing further, just know that all Knizner does is hit and hit very well. So far the "rankings" list across many sites don't give Knizner much respect. He is now ranked 5th in STL top 30 (Milb Pipeline source). He is not ranked in MLB Pipeline's top 10 catchers or its top 100 list. So lets look at what he has done the past few years, and why I feel hes not getting his proper respect. Drafted in 2016 in the 7th round. Has 185 at-bats in rookie ball and bats .319/.492/.915. Shows some pop with 6 HR out the gate. Next season in 2017 he is promoted to Full A and again shows some pop and hits 8Hr across 179 at-bats before being promoted to AA. At AA he bats .324/.462/.833 over 182 at-bats. This season he starts in AA and is promoted to AAA after hitting .313 in AA. Small sample size of AAA numbers but again he hits over .300 batting .313 over 54 at-bats. So we have a C who hits over .300 at every level hes been tested at with some signs of being able to be a 20-25 MLB HR catcher who could hit .280+ imo. Also he has several Milb awards including a 2018 Futures Game Selection. Their is no catcher on MLB Pipeline's top 10 C who is a career milb .300 hitter except Knizner. Yes i know im picking on MLB Pipelines site/ rankings. - We have a June 4th 2018 article from St.Louis Post-Dispatch titled "Heir Apparent to Yadi?" about Knizner. https://www.stltoday.com/sports/heir-apparent-to-yadi/article_067c8611-6a41-5e11-b09a-c159f420e138.html - Another article same site Aug 13th 2018 titled "Yadi's Successor:Kelly or Knizner?" https://www.stltoday.com/sports/baseball/professional/birdland/yadi-s-successor-kelly-or-knizner/article_8daed5f5-efa6-50c7-9e34-c433ba85f8a7.html - July 2018 article titled "St.Louis Cardinals: Andrew Knizner is making Carson Kelly irrelevant" https://redbirdrants.com/2018/07/03/st-louis-cardinals-knizner-kelly/ I could go on and on with articles. I also am reading rumblings of STL trading Knizner maybe to ATL who needs a long term solution at C. Bottom line I feel the kid needs to be higher in all sites rankings and if you can grab him...DO IT! Got it bro Ty. ONE TEAM LEFT! Going fast. First come first served. Update -3 teams left possibly 2 after today.